2-Part primer creates a barrier impervious to chemicals, corrosion, and moisture. Apply on aluminum, steel, and underwater metals for maximum corrosion protection as well superior adhesion for urethane topcoats & other epoxy primers. 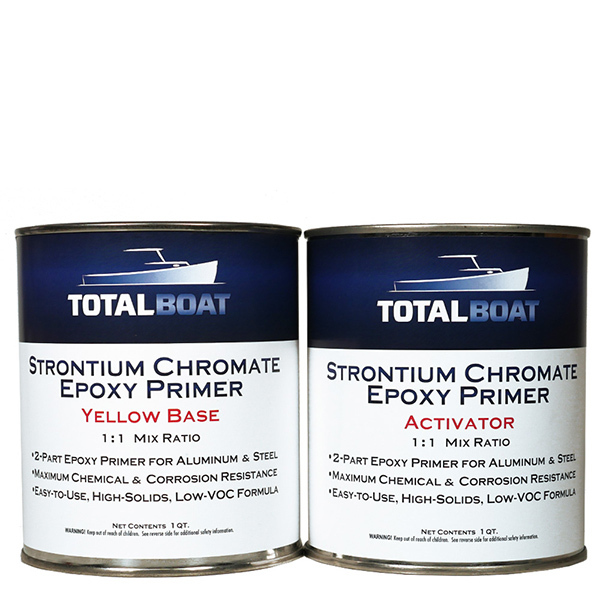 TotalBoat Strontium Chromate Epoxy Primer is specially formulated to prevent corrosion on metal boat surfaces. 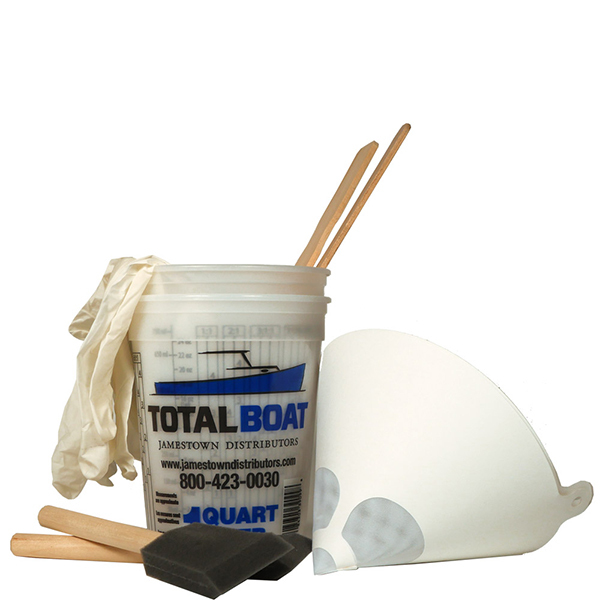 It is ideally suited for use on duck boats, aluminum boats, pontoons, & steel boats. This protective primer creates a barrier impervious to moisture and chemicals that not only protects the metal under it, but gives urethane topcoats and epoxy primer overcoats a surface they can really stick to. Strontium Chromate Epoxy Primer is great for more than just metal hulls—use it on aluminum spars and underwater metals, too. Bare aluminum oxidizes very quickly, which is OK if you don’t plan to paint it. But the oxidation that protects unpainted aluminum from corrosion makes paint or primer peel faster than a banana at a speed eating contest. Well maybe not quite that fast, but since there’s nothing appealing about peeling, we recommend treating aluminum surfaces with our TotalBoat Aluminum Boat Etch Wash first. It removes oxidation n just five minutes, and creates the etched surface necessary for successful adhesion. After the surface has been rinsed and dried completely, apply Strontium Chromate Epoxy Primer immediately. In fact, timing is everything with this easy-to-use primer. Plan to complete the entire surface prep process and application of 1 thin coat of TotalBoat Strontium Chromate Epoxy Primer within 4 hours, if possible, to prevent oxidation or surface contamination. TotalBoat Strontium Chromate Primer is a thin tie coat to be used for corrosion protection and adhesion—it does not fill surface defects. 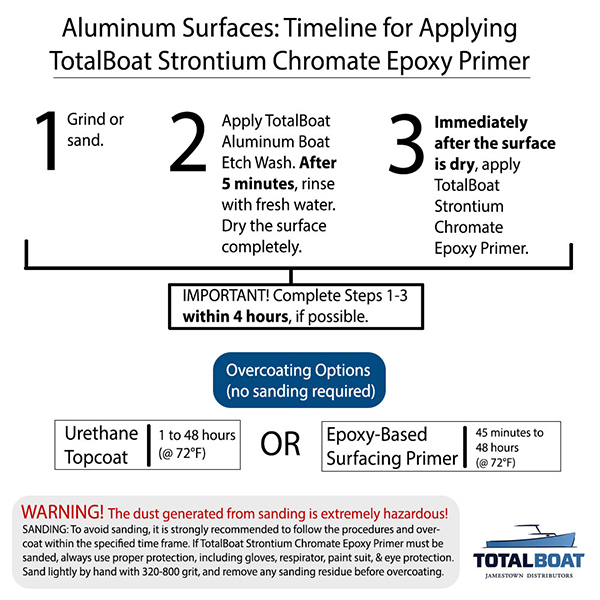 To fill small scratches and other minor surface imperfections, apply TotalBoat 2-Part High Build Epoxy Primer within 45 minutes to 48 hours of applying Strontium Chromate Epoxy Primer. WARNING! FOR PROFESSIONAL USE ONLY. A RESPIRABLE DUST HAZARD IS CREATED FROM SANDING THIS MATERIAL, ONCE CURED. SPRAYING THIS PRODUCT IS EXTREMELY HAZARDOUS. USE OF THIS PRODUCT REQUIRES THE WEARING OF PROPER PROTECTIVE GLOVES, PROTECTIVE CLOTHING, EYE PROTECTION, FACE PROTECTION, AND A PROPER RESPIRATOR. DO NOT BREATHE DUST, FUMES, GAS, MIST, VAPORS, OR SPRAY. DO NOT HANDLE THIS PRODUCT UNTIL ALL SAFETY PRECAUTIONS HAVE BEEN READ AND UNDERSTOOD.